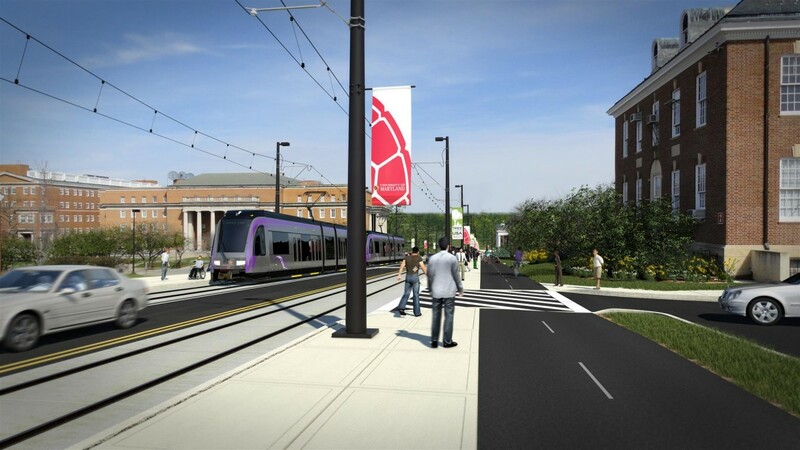 Above: The Purple Line is planned to run through the heart of the College Park campus of the University of Maryland. Plans to connect Bethesda to New Carrollton by light rail have been in the works for nearly 15 years. The Purple Line started off as a $1.2 billion transportation initiative in 2000. The transit line is now projected to cost $2.4 billion, or a little over $150 million per mile. The tab could be even higher. If built out using a proposal endorsed by outgoing Gov. Martin O’Malley, a portion of the Purple Line costs would be financed over a 30-year period, adding to the total cost. The 16-mile light rail transit line would provide 21 east-west stations between Prince George’s and Montgomery Counties inside the Capital Beltway. It is on course to be built by 2020. Developers want it. Business wants it. But does the incoming Republican governor want it? The project has all the markings a Republican governor could want – job creation, economic stimulus and a private business partner to help build and operate it. So why hasn’t Gov.-elect Larry Hogan signed on yet? While campaigning Hogan sent more signals he would reject the project rather than proceed with it, but recently he has settled on a stance that the project is worth considering and said he would not announce a decision until after he is sworn into office January 21. But in an Oct. 16 campaign fact sheet, Hogan called the Purple Line a fiscal and environmental “disaster” – stating costs had spiraled out of control, with no end in sight. He argued for clean fuel buses that he said would be “far less expensive” and more environmentally responsible. He also stated the line would help developers and not people. Yet, the wheels remain in motion to move the Purple Line forward. Last week the state approved a $5 million land purchase for the line and Hogan remained silent on the issue. This is the first of two stories examining the pros and cons of the Purple Line. Today’s story focuses on the positive arguments. Tomorrow’s story will focus on opposing arguments. Adding an east-west transit line would eliminate the need for commuters to travel into and out of Washington, D.C. on Metrorail to reach a destination on the Purple Line and it provides a direct connection to the University of Maryland College Park. However, taking on two major transportation projects simultaneously – the Purple Line and the Red Line in Baltimore – as proposed by the O’Malley administration, restricts funding for roads and highways. And it is not guaranteed that the $600 million to $900 million in private financing the state is expecting to receive for the project won’t count against the state’s tax-supported debt limit, causing credit issues. Meanwhile, critics have raised persistent questions about the ridership numbers required to make the finances work — and are being met with secrecy from the state about the calculations behind those estimates. Create 6,300 regional jobs. A workforce development initiative created by the O’Malley administration would seek to train thousands of local residents in transportation and construction jobs. Create a long stream of economic development, estimated to be $8 billion by Montgomery County Council President George Leventhal. Over two dozen real estate development projects are proposed to be built or redeveloped along the Purple Line corridor, according to an economic development map on the MTA website. The projects would add thousands of residential units, including townhomes, apartments, mixed income residential and affordable housing – as well as a variety of retail and commercial office space. Some of the projects propose hotels in Montgomery and Prince George’s County. The Capital Crescent Trail, an 11-mile hiker-biker trail originating in Washington, D.C., that runs through Bethesda, would be finished and improved to Silver Spring. Montgomery County will foot the bill for the construction, but MTA would build it as part of the Purple Line project where a shared right of way exists. However, some community members have raised concerns about the overall impact on the character of the trail as it would be next to the line and with fewer trees. Henry Kay, executive director for Transit Delivery and Development at the Maryland Transit Administration, said the goal is to invest in transportation and encourage development in areas where infrastructure and dense populations already exist. “The Purple Line addresses a long-standing deficiency in the transportation system in the Maryland part of the DC region – which is your ability to travel east and west between major business districts and residential areas – safely, quickly and efficiently,” said Kay. The pros and cons of the project were debated just last Wednesday at the Board of Public Works in Annapolis when Comptroller Peter Franchot questioned the purchase of $5 million in land to build the line. Gov. Martin O’Malley, a Democrat, and Transportation Secretary Jim Smith, the former Baltimore County executive, argued for the project. “It’s hard to imagine any governor will turn down $900 million in federal dollars,” said O’Malley, as well as the prospect to create 57,000 jobs. He blamed the opposition on a “very wealthy group of people” at the Columbia Country Club. “Both projects are fully funded,” said Smith, though that is disputed by critics. The project is “being watched all up and down the East Coast,” because it is a public private partnership. “We’ve had no indication from the transition team or the administration-to-be that they want any slow down,” Smith said. The land purchases were approved. Hogan is expected to name a new transportation secretary this week.